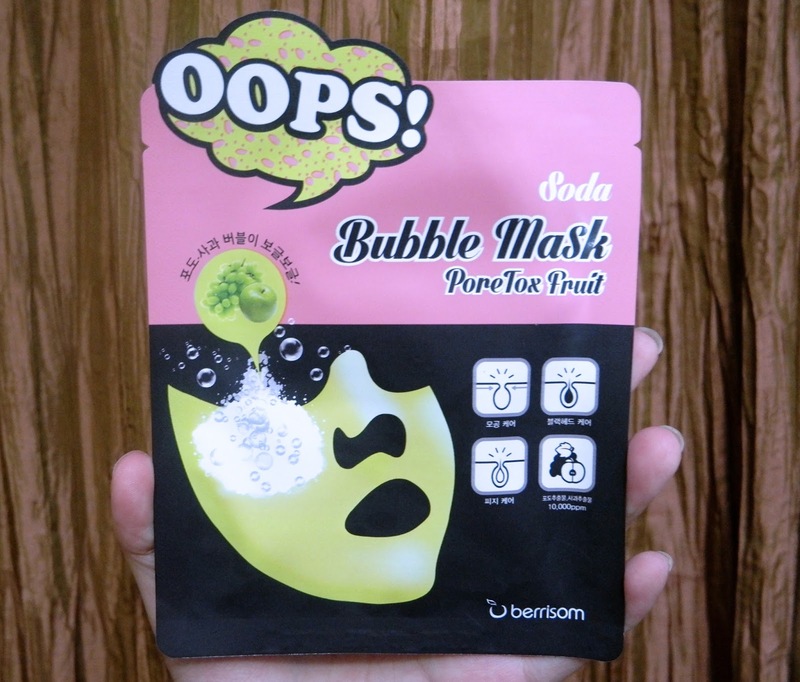 [Review] Berrisom Oops Soda Bubble Mask - PoreTox Fruit | The Broke Asian. 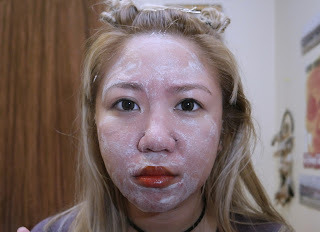 It's time for mask #2 of 4, courtesy of Beauteque's Mask Marketplace launch. Today's mask is the Berrisom Oops Sode Bubble Mask-PoreTox Fruit ($3.00). I find individual masks tend to be a little more expensive when there's something "special" about them, i.e. bubbles, animal prints, etc. If you happen to have read my previous post, then you know how disappointed I was about the last mask. Hopefully, this has different results. A refreshing self-bubbling mask that gives you a burst of nutrition with every pop of a bubble! Oops Soda Bubble Mask contains carbonated sparkling water which promotes brighter and clearer skin. 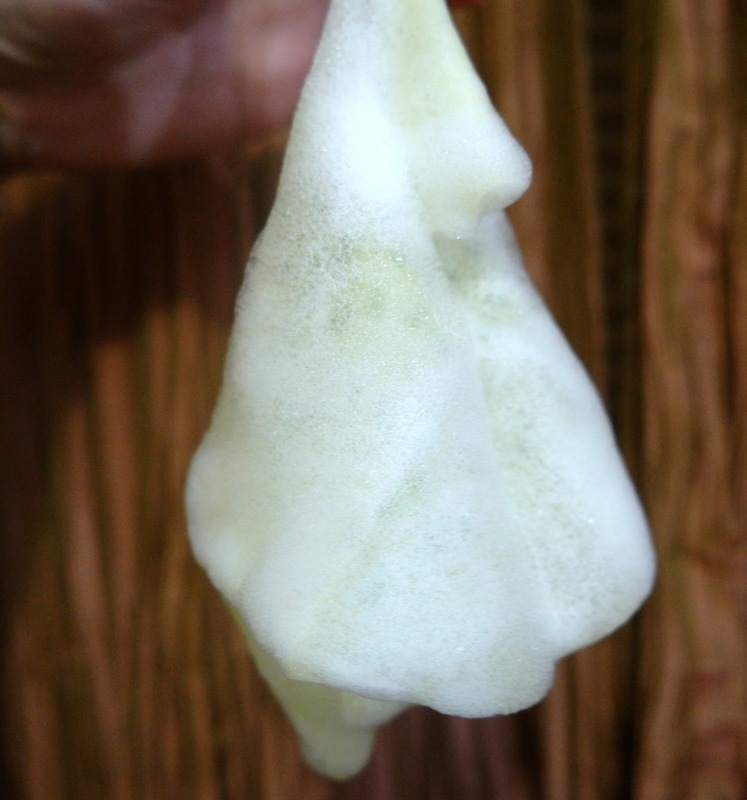 This mask variant in PoreTox Fruit targets deep-seated dirt clogging the pores. It has centella asiatica extract as its key component blended with pure extracts from persimmon leaves and green tea. This offers superior pore care that purifies and detoxifies the skin for it to be able to achieve tighter, finer pores. Apply to face after cleansing. Leave on for 5-10 minutes until bubbles form. 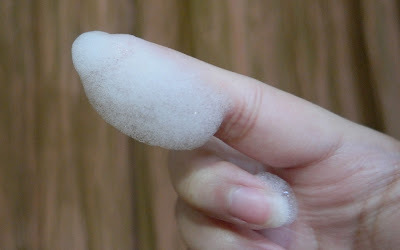 Remove mask and rub remaining bubbles onto skin. *It says 10-20 minutes on the package, but trust me...you won't last that long. Water, Glycerin, Cocamidopropyl Betaine, Sodium Cocoyl Apple Amino Acids, Disiloxane, Dipropylene Glycol, Grape Fruit Extract, Malus Domestica Fruit Extract, Methyl Perfluoroisobutyl Ether, Sodium Lauroyl Glutamate, Phenoxyethanol, Hydroxyethylcellulose, Chlorphenesin, Caprylyl Glycol, Fragrance, 1,2-Hexanediol, Propendiol, Disodium EDTA, Anise Fruit Extract, Sodium Hyaluronate, Centella Asiatica Extract, Camellia Sinesis Leaf Extract, Diospryps Kaki Leaf Extract. Let me be honest here. I'm excited about the bubbles. 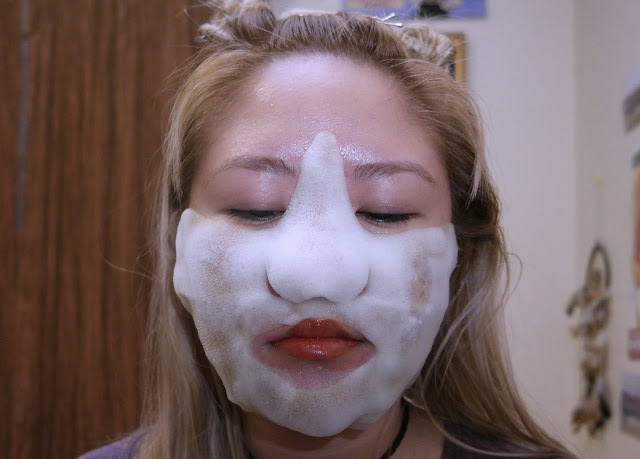 Bubble masks have become popular over the last couple of months, especially the Elizavecca Milky Piggy Carbonated Bubble Clay Mask that I have yet to try out. The packaging itself isn't overly extravagant, but it was enough for me to get interested in it. I've tried other Berrisom sheet masks before and have liked them, so I trust that I would like this one as well. Okay, so even though it clearly shows on the packaging how the mask was going to look, I don't think my brain fully comprehended that there wasn't going to be a forehead part. After the mask started to bubble up, I appreciated that there was no forehead part. It looks like I hate my life here, but I promise that wasn't the case. What it looks like right when you put it on. I just washed my face and my forehead is ALREADY OILY. 5 minutes after putting it on and just right before I ripped it off my face. I actually fixed the chin part so it'd look better for the picture, but regretting it since I should've just showed how much it was drooping down. As you can tell from the picture above, my nostrils were covered. Every time I inhaled, bubbles would go up my nose. I think the mask was a little too big, and I feel like my face would've benefited from it better if it was just a little smaller. I read some other reviews before trying this and some stated that the bubbles got into their eyes, but it didn't really get near my eyes. If I look concerned in the next picture, I was. It was at this moment, I realized that my skin was not going to absorb the "essence" and that it needed to get rinsed off. Let me explain myself. Before trying out this mask, I read a couple of customer reviews from other sites and a particular store had instructions that stated that the bubbles left on the face were to be massaged and absorbed. A lot of the reviews were saying how sticky it was, while others didn't mention anything rather than their skin felt amazing afterwards. Most customers left it on, while one said they couldn't the stickiness and washed it off. I had read this right before putting the mask on, so I didn't recheck the instructions on Beauteque. My terrible mistake. I had applied my serums and essences before putting this on, thinking I just needed to rub the remaining bubbles on my face. RUBBING THE BUBBLES WILL TURN IT INTO A CLEANSER CONSISTENCY. RINSE IT OFF. I was a little disheartened that I had to rinse off the first half of my skincare routine, but there really is no one to blame but myself. Nothing really felt different after I rinsed it off, except maybe that my skin felt extra clean. I typically double cleanse to begin with, so I felt like this was overkill cleansing. Not the life-changing mask I was searching for. While the bubbles forming gave me a nice tingly feeling around my face, the happiness didn't last. There was a lot of foam, and it ended up weighing the mask down. The flap that goes on top of the nose was so big, the foam starting to cover my nostrils and breathing just got annoying. Once it reached 5 minutes, I kind of just gave up on it and took it off. I'm giving it 3 out 5 because my face did feel cleaner, possibly even smoother, after rinsing. HOWEVER, I hate that I had to rinse it off. Another website stated that you pat the essence until it's absorbed and don't rinse it off, and silly me had put on my serums and essences before putting this mask on thinking I wasn't washing anything off. It will leave you sticky if you don't rinse it. Annoyingly sticky. My fault for messing up the instructions though. So if you see any other reviews out there saying it was sticky because they didn't rinse it out...they should've. I think it's fun to try out if you're looking to do something new with your routine and don't mind spending the $3 to try out something different, but it's a "no" on repurchasing for me. I'm glad I tried it, but I'd rather not go through this again. Not recommended if you have dry skin. With 800+ to chose from on the Beauteque store, I'm starting to think I make bad mask choices. Anyone else think so? 2 more masks to try out in the next 2 weeks though. If you have dry skin or live in a hot/humid environment, please wait for my next mask review! If you haven't already, taken a look at their increasingly wide selection of masks, especially right now with their sales!